In 1960 my family traded one world for another when we emigrated to Canada. Through the mail we maintained a very tenuous connection with Catalonia. My aunt would from time to time mail us packages. Usually the packages were rolls of Spanish newspapers and magazines wrapped in brown paper and covered with lots of stamps. Presumably my aunt thought that the magazines and newspapers would be of interest to my parents at a time when news from Spain was hard to get through the Canadian media. It was like receiving packages of cultural sustenance, the newspapers and magazines to be thumbed through for months after they had been received. For my sisters and me the arrival of a package from Spain was a great event because the space in the centre of the roll would be packed with candy and the type of liquorice that could not be had in Canada. Sometime in 1963 we were surprised when instead of a roll, a boxed package arrived. In addition to the newspapers and magazines the box contained several records. I am not sure how many there were but it was probably a half dozen or so. Now, those records were quite a novelty because they were all in Catalan. Under the Franco regime’s strict control of the Spanish media the Catalan language was rarely heard or even seen in a public forum. Throughout the 1950s and 1960s there were no Catalan-language newspapers and very few books published, and there was no Catalan radio or television. So the arrival of a batch of Catalan recordings was unexpected. For me as a seven-year-old, there was little novelty, as the language at home was Catalan. What was the fuss about? The recordings were a varied lot, children’s stories, and for adults non-political comedy, but there was one record of music. That record, or rather the photograph on the cover sleeve left a long lasting impression on me. I listened to the music on that record but for someone whose only sources of spoken Catalan were his parents, I had difficulty understanding the singer’s words. In any case, if I could not understand the words I would not remember the tune either. Again, it was the photograph on the cover sleeve that fascinated me. I remember looking at that photograph many times because I thought that there was a story in the image, perhaps even a message for me. In the foreground stands a young man next to a weathered wooden door set into a brick wall that recedes into the background. The man is wearing a coarse woollen sweater and has a guitar tucked under his left arm. He stares at the camera with sad looking eyes and he seems out of place in the bleak surroundings. What always caught my attention when I studied the photograph was the little boy in the background staring up at the man with the guitar. The boy would have been about the same age as me. He is leaning forward while pulling on a rope attached to the wall. The boy does not seem to be especially unhappy but he has a sad wistful look in his face. He seems to be part of the neighbourhood, a poor part of some tough town, I thought. His clothing is coarse and it looked shabby and worn. Who was the little boy? It made me sad to look at the photograph. I had the odd thought that the little boy in the photograph could have been me, if we had stayed in Spain. The man with the guitar was Ramon Sanchis better known as Raimon a Catalan singer originally from the province of Valencia. The record was in fact an EP, an extended play disc, the same size as the old 45s, and it contained four songs including al Vent, translated from Catalan as The Wind. 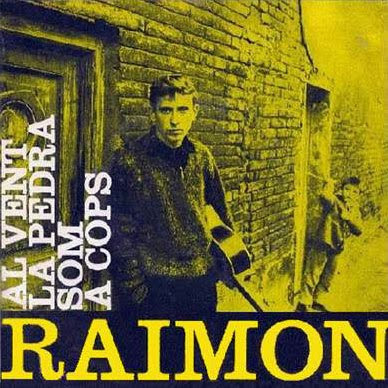 Raimon was part of La Nova Canco, or the New Song movement, and al Vent was one of the most important expressions of the genre. The singers and musicians of La Nova Canco had taken to promoting the Catalan language through music and challenging the Spanish dictatorship. They directly provoked the post-civil war Franco regime with songs that had somewhat obtuse meanings but whose messages were readily understood by the Catalan public. La Nova Canco enabled Catalans to gently promote and protect their ancient language and further their aspirations for greater freedom. There were parallels with the folk movement in English-speaking countries and, later in the decade, to the protest movements in North American and Western Europe. As a boy I had no inkling of La Nova Canco. During the 1960s Spain was a very long way from Canada. For some reason my aunt had thought it important enough to send a copy of Raimon’s record. Growing up in Canada I was only vaguely aware of what had happened and what was going on in Spain. My parents had both lived through the civil war and its aftermath and they would have understood the implications of the words of al Vent. They had made a choice to move to Canada and had no intention of going back. Still there was always the thought of what life would have been like if they had stayed put. For a long time whenever I looked at the little boy in the photograph on the cover of Raimon’s EP it was if I was looking through a window into another place and time. What would life have been like if other choices had been made? All this came to mind a few days ago when I visited an exhibition at the Museu d’Historia de Catalunya entitled La Nova Canco; la veu d’un poble—the New Song; the Voice of a People. Marking the fiftieth anniversary of the movement, the exhibition underlined Raimon's importance. Of course there was a copy of Raimon's EP, the little boy still staring up at the singer. The exhibition notes stated that the photograph had been taken on a February day in Barcelona’s Raval neighbourhood, one of the city’s poorest and toughest. For those who grew up in Catalonia in the 1950s and 1960s La Nova Canco had a different meaning than it did for me. I was living in a different world and while Raimon’s song made little impression on me, I am just old enough to remember the Beatles’ two live appearances on the Ed Sullivan Show early in 1964.